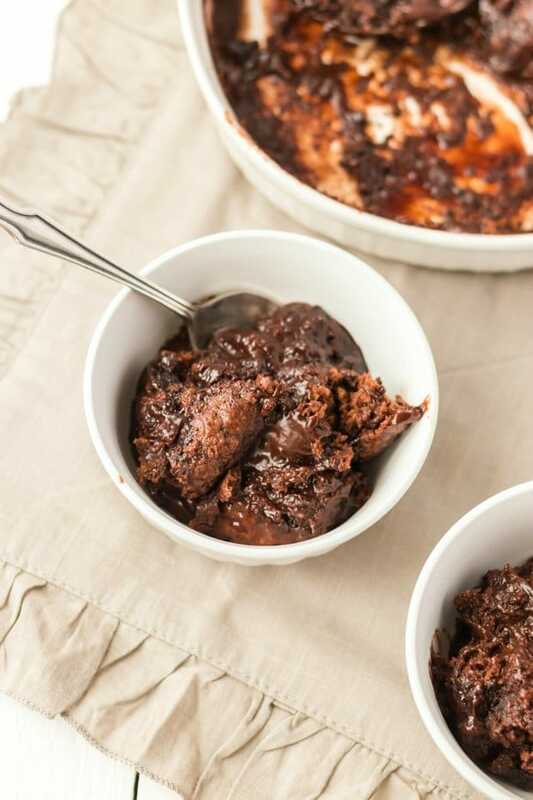 This chocolate pudding cake recipe is a chocolate-lover’s dream. It is a cake that makes its own sauce while baking. The ingredients are the same as of any cake, but what brings on the magic of a pudding cake is the extra liquid poured on before baking. This transforms this cake into a moist dessert as the liquid is baked into the cake. The result is a crispy exterior with a decadent pudding-like texture at the bottom. For more amazing dessert ideas, make sure you also check out our banana pudding cake and chocolate icebox cake. Our chocolate pudding pie is also fantastic. A pudding cake is the perfect combination of textures! 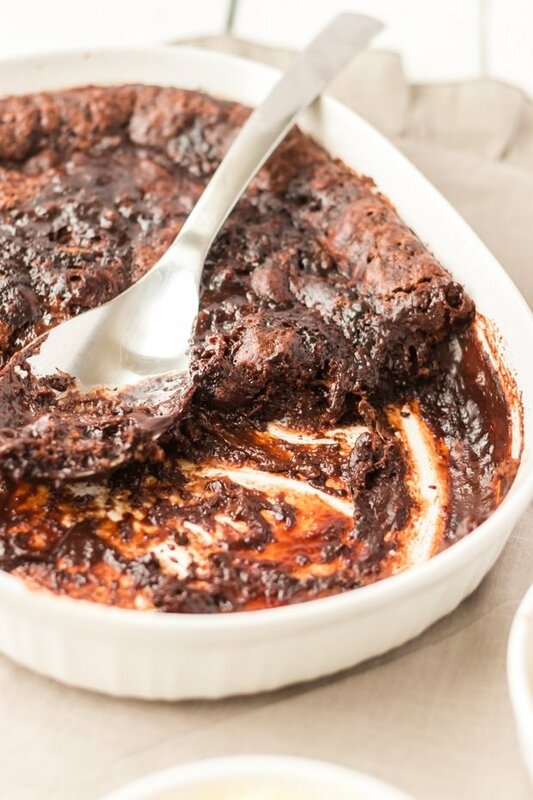 With its fudgy, pudding-like texture and chocolatey flavors, it is a sure fire win in my book. With one simple trick, this cake will taste like a more moist, fluffier version of a brownie. It’s not a complicated dessert to make at all, so it definitely is an anytime dessert. Our recipe calls for chocolate but there are so many different possible flavors you can use. You can always go for an old fashioned vanilla pudding cake. Or, try out some fruity flavors like banana, lemon, or strawberries. This pudding cake is extremely simple to create. It’s a normal cake, except for an extra step that will make all the difference. You’ll be using this trick on any cake that you make just to switch things up a little! For the batter, mix together the flour, soda, salt, sugar, vinegar, milk, melted shortening, nuts, and add in 2 tablespoons of cocoa. Move the cake mix into a baking pan. Put together another mixture of brown sugar, 4 tablespoon of cocoa, and the boiling water and pour this syrup over the cake batter you just made. This last step is the key to the “pudding” part of the pudding cake. Now, your oven is waiting! When baking chocolate pudding cake, the oven is where the magic happens. While you’re making your cake mix, be sure to preheat the oven to 350 degrees. Move the cake to the oven and bake the cake for 40 to 45 minutes. When it’s done, it should be slightly crispy on top and oh-so-ooey-gooey at the bottom, just like hot fudge. What goes well with an already near-perfect dessert? I always love putting ice cream on everything, so that’s an obvious pick. 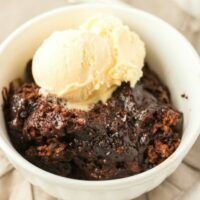 For chocolate pudding cakes, it’s great also with heavy cream or whipped cream on top for a milky creaminess that can balance out the sweetness. Chopped nuts, like walnuts or pistachio, sprinkled on top or mixed in with the batter adds yet another layer of fun textures to this treat. Does Pudding Cake Need to be Refrigerated? 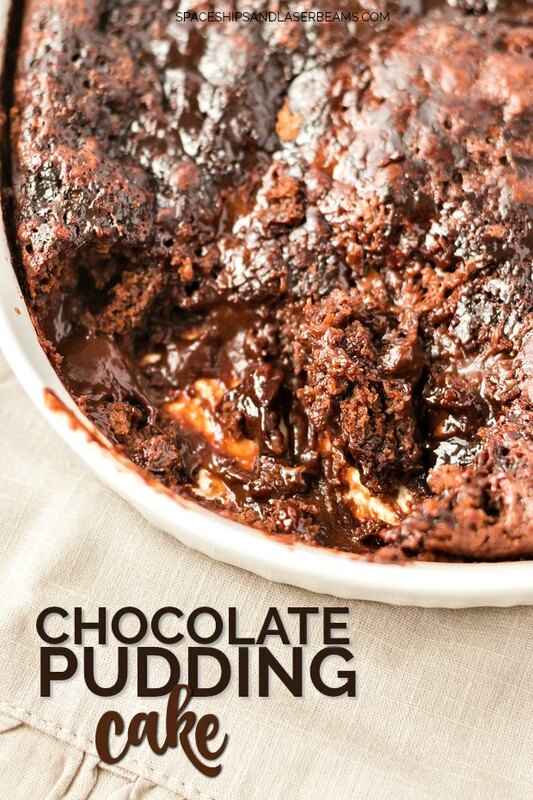 Refrigerating your pudding cakes give it another kind of deliciousness. The coldness from the fridge thickens the pudding sauce. Pudding cakes bring back some fond childhood memories for me. This recipe is something my grandma used to always make for us. We’d sit around the dinner table digging our spoons directly into the cake and fighting over who’s got the most perfect spoon ratio of cake and pudding. I hope your guests love it as much as we do! Blueberry Cobbler <- Reader Favorite! 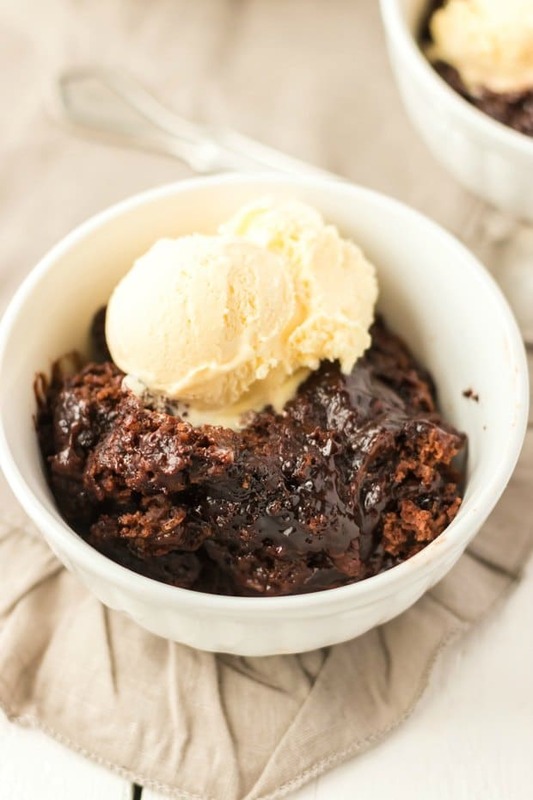 This incredible chocolate pudding cake is a family favorite for good reason! Once well mixed, pour into a baking pan. Now, mix brown sugar, remaining four tablespoons of cocoa powder, and boiling water together then pour this syrup over the brown sugar mixture. Bake 350* for 40-45 minutes. When done, it will be slightly crispy on top and gooey on the bottom, just like hot fudge. Delicious! Totally drooling… can’t wait to eat this!